So let’s say you’ve just gotten your grubby little hands on one of the rarest Lego pieces ever – the gold C3PO figure. This near-priceless item combines the dork powers of Star Wars and Legos in one little “minifig” encrusted in precious, precious gold! After you experience the best dorkgasm of your life, you have to figure out where to stash this valuable heirloom. You could put in in a bank safe deposit box, but that’s no fun…and besides, most banks probably frown upon playing Lego in their secure areas. Lame. You could hide it in your panic room, but you just KNOW that as soon as you go in there, Jared Leto is gonna show up, LIKE HE ALWAYS DOES, trying to rip you off. Leto…Lego…think about it, man. Too risky. …but why do that when you can have a SAFE MADE OUT OF LEGO!!!! Tech blog SLIPPERY BRICK writes, “You might think that a Lego safe would be easy to open. Maybe just remove a few bricks and you’re in. But that’s not the case with this thing, the cutting edge of Lego safe technology. The safe weighs 14 pounds and has a motion detecting alarm so it can’t be moved without creating a huge ruckus. Now, some parade-raining commenters on the Youtube page point out that by indicating that a given code-number entry is correct, the safe’s designer actually reduces the needed amount of attempts to about 450. But still. It’s a SAFE made out of LEGO! 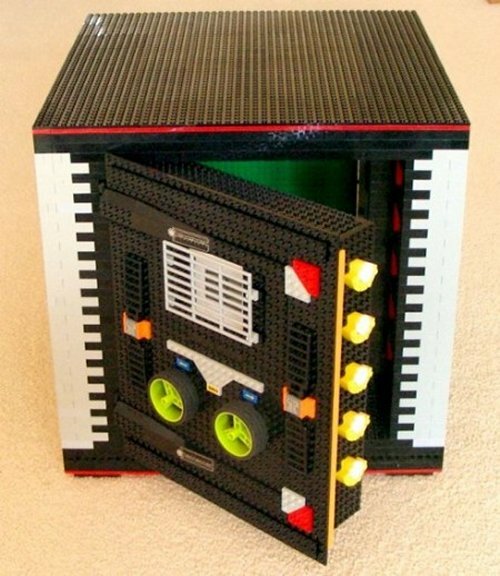 Lego is Danish for “play well.” And this safe is very well played indeed. One Response to Lego Lockdown!